She was carried to a place she had never been. It was much more vivid than a dream, it had a depth and a color to it, and exquisite detail that made it seem more real than the time with her mother in the courtyard, more real than the dreamy hours she spent sometimes looking out at the great lake of Magdala, the one so grand they called it a sea: the Sea of Galilee. She was elevated, put on a high pillar or a platform, she could not tell which. And all around her were people, gathering at the base of it, looking up at her. She turned her head to the side and saw that other pillars had other people on them, that there was a whole row of them, stretching as far as she could see. The sky was a yellowish color, the color she had only seen once, when there was a sandstorm. The sun was blotted out, but there was still light, diffuse golden light. She felt the hand holding hers, and it was smooth like a piece of marble, not cold, not hot, not sweaty, but perfect. She wanted to squeeze it but dared not. And then the figure-she still did not know who it was, she dared not look at the face, only at the feet in golden sandals-lifted her up and took her away, and the journey was so dizzying that she lost her balance and began to fall, to plummet, and it was very dark beneath her. She sat up with a jolt. The oil lamp had burned out. Outside she could hear the gentle sound of the water of the great lake, not far from her window, as it lapped the shore. She held out her hand, felt it. It was moist. Was that why the being had let her go, had dropped it? She rubbed it hard. No, let me cleanse my hand! she cried out, silently. Don’t abandon me! I can wipe it off! But the only answer was the stillness of the room and the sound of the water. She rushed into her mother and father’s room. They were sleeping soundly; they did not need a lamp, they slept in darkness. “Mother!” she cried, grabbing her shoulder. “Mother!” Without permission, she climbed into the bed and huddled under the warm covers next to her mother. “I have had such a strange dream,” she cried. “I was taken up…into some heaven, I don’t know where, I only know it was not of this world, it had angels, I think, or…I don’t know what…” She paused, gasping for breath. “I think I was…I was called. Called to join them, called to become part of their company…” But it had been frightening, and she had not been sure she wanted to join them. “Nathan-” Mary’s mother reached out and tried to restrain him, by touching his shoulder. “They asked if I would join them. They said, ‘Will you come with us? '” Even as she recited it, she could hear the sweet voices. But Mary knew what she had seen, the transcendent glory and warmth of it. “But, Father,” she said, “the message, and the invitation, were so clear.” She kept her voice low and respectful. But she was still shaking. She clung to her mother, but her mother thrust her aside. “Do as your father says,” she ordered. Mary returned to her room, the majesty of the dream still enveloping her. It had been real. She knew it had been real. And if it was real, then her father was wrong. “What kind of idol? I’ve never seen an idol!” she asked eagerly. Now Mary remembered this, but all her earlier curiosity about Jerusalem was eclipsed by the dream, still so vivid to her in the darkness. Busying herself with the final preparations, Mary’s mother, Zebidah, had suddenly broken off measuring grain into the travel sacks and bent down to her daughter. She did not mention the dream. Instead she said, “Now, as for this trip, you must not mingle with any of the other families coming, except for the few I tell you are acceptable. So many people do not keep the Law and only want to go to Jerusalem-and even the Temple!-as some sort of holiday. Stay with the other observant families. Do you understand me?” She looked hard at Mary. In that instant her pretty face was not pretty but forbidding. “Like mixing milk and meat?” Mary asked. She knew this was absolutely forbidden, so much so that anything pertaining to them must be separated. They were ready. The six families making the journey together waited, donkeys loaded, packs slung over their shoulders, on the road above Magdala for the larger groups from the nearby towns to join them for the trip to Jerusalem. Mary would start out riding a donkey: the youngest traveler in the family, she did not have the stamina to walk long distances. Perhaps on the return journey she would be so toughened that she would not have to ride at all. That was her hope. The dry season had begun, and already the sun felt hot on Mary’s face. It hung brazenly over the Sea of Galilee, where it had risen earlier from behind the mountains. At dawn those mountains across the lake had been the color of tender grapes; now they showed their true colors of dust and stone. They were quite bare, and looked, Mary thought, malevolent. But perhaps that was because the land of the old Ammonites had such a bad reputation as Israel’s ancient enemy. What was it the Ammonites had done that was so bad? King David had had trouble with them. But, then, he had trouble with everyone. And there was also that evil god they worshiped, although Mary could not at first remember his name. He made the Ammonites sacrifice their children to him, putting them into the flames. Mo…Mol… Molech. Yes, that was his name. She held up her hand and squinted across the lake. She certainly could not see any temples of Molech from here. She gave a shudder, even in the warm sun. I won’t think any more about Molech, she told herself sternly. The lake, gleaming in the sun, seemed to agree. 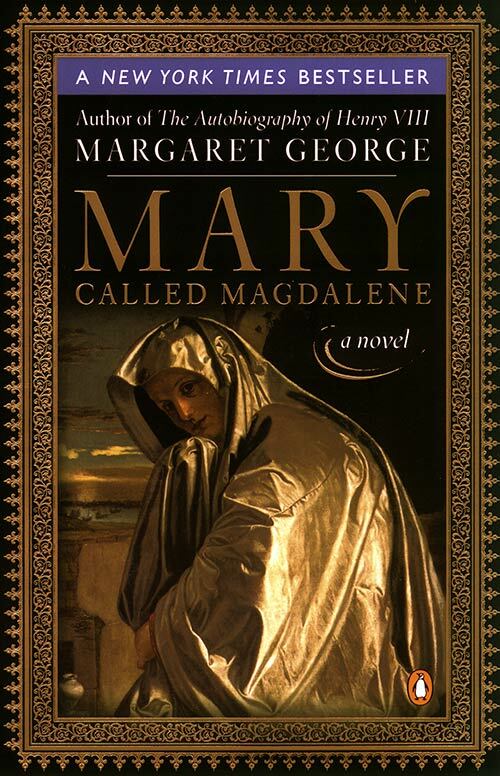 It was too beautiful for its blue waters to be stained with thoughts of a blood-dripping god; it was probably the most beautiful place in all Israel, Mary firmly believed. No matter what was claimed for Jerusalem, how could anything be lovelier that this oval body of water, bright blue, surrounded by hills cupping it protectively? She could see fishing boats out on the waters; there were a great many of them. It was fish that her town of Magdala was famous for-here they were salted, dried, traded, and shipped all over the world. Magdala fish were a presence on tables as far away as Damascus or Alexandria. And a presence in Mary’s own home, for her father, Nathan, was a leading processor of the fish hauled into his warehouse, and her oldest brother, Samuel-although he had taken to calling himself the Greek name Silvanus for trading purposes-was the business manager, dealing with both local people and foreigners to arrange sales. Thus the big mosaic of a fishing boat that decorated their entrance hall indicated the source of their wealth. Every day as they stepped across it they could be reminded and give thanks for their good fortune and God’s multitude of fish in their sea. An east wind struck the waters of the lake and made the surface of the water tremble; she could see the ripples of water that did indeed look like harp strings. The old, poetic name for the lake was Lake Kinneret, Lake Harp, because of its shape and also because of the pattern of the wind on the water. Mary could almost hear the fine sound of plucked strings, singing to her across the water. “Here they come!” Mary’s father was gesturing to her to urge her donkey back toward the others. Down the dusty road she could see a very large caravan approaching, with even a camel or two besides donkeys and the mass of walkers. “They must have celebrated the Sabbath too long yesterday,” said Mary’s mother, tartly. She was frowning; the late start was a nuisance. What was the point of delaying the departure until after the Sabbath if they were to lose a half-day anyway? No one ever started a journey the day before the Sabbath, or even the day before that, if it was a long journey. The rabbinical law forbidding walking more than about a Roman mile on the Sabbath meant that would waste a day-as far as travel was concerned. Eli flared, as Silvanus knew he would. The younger man had a hot temper, despite all his efforts in studying the ways and whys of Yahweh. With his fine, straight-nosed profile and noble bearing, he could pass for Greek, thought Silvanus. Whereas he-he almost laughed-looked more like the little scholars who were always bent over the Torah in the beth ha-Midrash, the House of Learning. Yahweh must have a mighty sense of humor. Eli snorted and turned away, pulling his donkey with him, so that its hindside was facing Silvanus, who merely laughed. Silvanus had a point; the Greeks welcomed others into their culture, whereas the Jews guarded theirs like a secret. Each action was the result of thinking theirs was superior: the Greeks thought that one taste of Greek culture would instantly win anyone over, whereas the Jews felt theirs was so precious it could be desecrated by offering it to any and all passersby. Naturally this made Mary all the more curious about both of them. She would learn to read, she promised herself, and then she could tap into the magic and mystery of the holy writings herself. “I’m sorry that you credit only yourself with the finer feelings,” Silvanus finally said. He halted and fell back into another group; he would not be traveling close to his brother on this journey. Mary did not know which one to keep near, so she went over to her parents. They were walking resolutely, their faces set for Jerusalem. The sun beat down, its brightness causing them to squint and shield their eyes. Clouds of dust were blowing. The startling green of the Galilean spring grass had begun to fade, replaced by a dun mat; the jewel-colored wildflowers that had dotted the hillsides had wilted and disappeared. From now until next spring, the landscape would become progressively browner, the glorious burst of nature’s love merely a memory. Galilee was the lushest part of the country, the nearest thing to a Persian garden paradise in the land of Israel. The branches of the fruit trees were laden with new apples and pomegranates; the bright-green early figs were peeking from under their leaves. People were gathering them; new figs never remained on the trees long.